Post more often and work on those girls. You could always threaten to abandon them in Chelsea and see if that'll get them in line. Arsenal is not so bad. At least they play pretty football. On the other hand, if she were pushing Chelsea........well, lets just say the jury would probably find it justifiable. Looking forward to cheering on the Whites this season and getting to know the FoF community a bit better! Great to have you Matt and great to see another fellow American on the board look forward to see you more on the board and reading your post. Howdy! My name is Lyle, and I am a Fulham fan going back to the 2006-2007 season. I live in Brede Hangeland's birthplace of Houston, Texas. I am originally from Louisiana, but have lived in Texas for over a decade now. 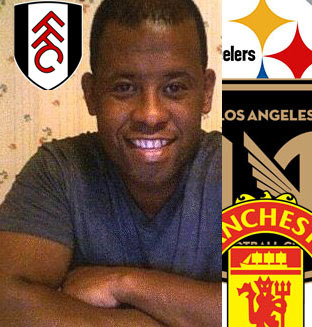 I used to be a member of the FFC website forum way back when as Crispus Attucks, and I was a forum poster at FulhamUSA when it existed. I even met up with a couple of FulhamUSA folks years ago at a Houston pub to watch Fulham play. I haven't been following Fulham super closely the last several years, but I am back to paying more attention now. I chose Fulham for its history, Craven Cottage, and the fact that it wasn't a powerhouse club. The character of the club just seems to fit my personality more than some other clubs. It's gentlemanly. The Americans on the team, like McBride and Bocanegra, helped at the time too. I remember you as Crispus. I wonder if our hosts ever figured out who the real Crispus was? Welcome back. The overseas board has been almost inactive for some time. A lot of yanks bailed when Deuce did. The horrible football under Jol and the crazy kraut didn't help. BTW, hope you and yours came out pf the recent hurricane/flooding ok.
What's up? Yeah, I posted quite regularly under Crispus Attucks. Loved it. I remember one person saying something about it, but I think they were American. Good times. I made out okay during Harvey. Weirdest hurricane I've ever been through. Wasn't all that powerful for Houston, but then the thing took 5-6 days to move past us dropping an insane amount of water. Where I live got standing water of over a foot. I live in a second floor apartment and made out fine. I had to take a neighbor in from the first floor. They got 5-6 inches of water in their place. The water receded very quickly so we weren't in need of rescue. It wasn't a bayou, creek, lake, reservoir, or river flooding. Most people in Houston made out fine, but if you were right up near a body of water, you probably had catastrophic flooding. Some folks within walking distance of me with homes near White Oak bayou got wiped out. The level the water had to get to get inside their houses is amazing. Houston is picking up and moving forward. I never really stopped following Fulham, but once FulhamUSA had website issues and the Fulham forum went away, I just kept away from Fulham fandom. Got back into baseball following the Astros in some lean years, but recognized they were building up something good, which is happening now. Fulham looks good though. Bought the TV package. Watched the Boro and Forest games. Likeable team and I admire the owner Khan. Seems like a cool dude. I have been watching more Bundesliga now too. I was a student in Germany and worked there one summer. I was near Cologne and pay attention to 1. FC Koeln. Great fans, but their team is a mess right now. Historically a big team in Germany, but since the late 90s they've been a yoyo team, going up and down. Kia ora all from Auckland NZ. I’ve been here 16 years. Technology smiles on me now as I can get up n watch at 4am! 55 years old from Putney, first game taken to CC by my brother in ‘71 v Charlton, won 1-0 and hooked. Glorious years up until 77 when I got an undeserved kick in that put me off going for many years but always checked scores, drifted back in 90s during Phoenix era! Loving the way Slav has us sorted. Exciting times and love some of the groups on FB as some great characters!! Cheers for letting us in. Usually well behaved but like most like caps drop a F occasionally. Looking forward to discussions here. Wish site had update to more accessible on mobiles. My name is Ramón and I am from Two Sisters a city of Seville, in Spain. My fauvorite team is Real Betis Balompié, why Fulham is a good question. To get started, I love the English league, the charm of its stadiums and when I first saw in photo Craven Cottage, I fell in love, wonderful. Since that day I follow everything I can to Fulham. The past November of 2013 I fulfilled a dream, I visited Craven Cottage to see a football match, Fulham vs Swansea. I wouldn´t forget this day, the only bad point, the result, defeat. But see Craven Cottage, see a football match and when the match ended, appreciate the stadium and watch a dream come true, it's fantastic. This year I want to come back and watch another game. - From New Jersey in the States, played soccer as my main sport all growing up. - Been a Fulham fan since McBride days (though not the main reason why I chose the club). Working in a global job (and in many cases directly for a Brit or two), I know a lot of folks overseas, and everyone obviously had their club. I stayed a general fan for a bit, and once I was more familiar with the Premier League, found the history of Fulham as London's oldest club, and the Cottage, as something I could get behind, even if they weren't 17-time League champions, etc etc..
- Visited Craven Cottage in summer of 2013 with my 3 boys in tow (all soccer players). Was allowed to go out to the pitch, since it was off-season, got some great pictures. Great time. One of my sons is a Liverpool fan. At least he hates Chelsea. Since I was 8 years old I've been a Pittsburgh Steelers fan....my favorite athlete of all time is Dr. Julius Erving (basketball known as Dr. J). My most recent favorite athlete has been Kobe Bryant. So my favorite sports to watch use to be American Football and Basketball. 12 years ago I divorced my wife. At the time my daughter was 2 years old. 10 years ago....the man that ended up spending those last 12 years with my ex...started coaching soccer to my 4 year old daughter. So yes...I now include Manchester United with the Pittsburgh Steelers, Golden State Warriors and Los Angeles Football Club as the sports franchises that I really like a lot. The Steelers are the only team that fall into that LOVE catagory because they were my first. Mostly because of the owner. He's an American success story...he also happens to own an NFL team that I was hoping would come to Los Angeles a few years ago. I didn't want the RAMS or the CHARGERS back in LA. I wanted the Jaguars...whose games I'd started watching along with my Steelers. Clint Dempsey...always respected him as a fighter. Decent footballer imo. I've now watched 3 full Fulham matches. They play better ball than Manchester United. They actually use their #9 (Mitrovic) the way United DON'T use Romalu Lukaku. Fulham have an offensive identity that I can see. United don't. Fulham is more entertaining to watch than United has been the past 3 seasons. I hate Jose Mourinho. The only thing Fulham appears to be missing are two world class defenders. One to play CB and one to play LB. Otherwise...the team is an entertaining team to watch. Last thing I'll say is that over the past 5 years world football has become my clear cut favorite sport to watch. I owe that love to Manchester United and my daughter. Edit: I just joined FulhamTV and I've gone back and watched 5 (90 minute) of the matches that started Fulham's unbeaten streak last season. Great broadcasts. Welcome! I live just north of LA, in the hills west of Palmdale and east of Castaic. A small part of Cali that is still what it used to be. I'm planning on moving out next year. Agree with you about the Galaxy and Mourinho. I too can't get into MLS. Bradley has done a good job at LAFC but the quality of the football to put it bluntly, is poor. I lost interest in the NFL some year ago. The games seem to be more about personalities than the actual game. That and ESPN can't broadcast any sort of sport without making the announcers more important then the actual contest.If you haven't heard a FFC match broadcast by Gentleman Jim, you are in for a treat. He is the original "homer". He is wonderfully partial and his voice just gushes with his love for Fulham. I think you'll find our British hosts to be quite wonderful. Keep quiet about ManU. On here they're known as Manure and Chelsea is known as the blue poo or the scum. LOL There are a number of Americans on here. I joined when McBride came aboard, 2004 I think. There are many of the locals who were born into Fulham. A number have been fans for 60-70 years. Keep in touch and post often. If you get snipped at, ignore it and phrase all that is Fulham. Hi everyone, long time guest, registered yesterday because I think I need a place to vent as this season unravels. Born in Hammersmith, grew up in Wandsworth. My uncle, a Chelsea fan, would take me to any local game that was cheap (it seems unbelievable now, but you used to be able to decide on the day what match you would take in). I hated Chelsea, Brentford and QPR barely registered with me, but something about The Cottage, the colours and the walk to the ground made me a Fulham fan. I was a season ticket holder in the Riverside, but in 2011 I moved to the Czech Republic to raise my family with my Czech wife. If any of the guys here are ever in Pilsen and fancy a few of the excellent local beers and a football chat let me know!